The winter Milky Way rises over Burns Lake in Big Cypress National Preserve. Photo by Aaron Umpierre. The National Park Service and IDA are pleased to announce that Big Cypress National Preserve has been designated an International Dark Sky Park. With the extent of urbanization in the eastern United States it is becoming nearly impossible to experience the night with little impact from artificial light pollution. 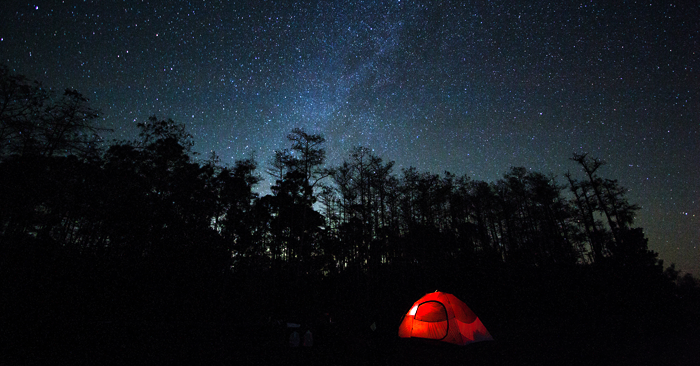 In south Florida, away from the urban development of the east and west coasts, Big Cypress has one of the last protected night skies where visitors can still enjoy the splendor of the Milky Way and see a night-sky strewn with thousands of stars with only the naked eye. With this designation Big Cypress National Preserve becomes the first of the 19 National Preserves to achieve Dark Sky Park status. It is the first National Park Service (NPS) unit east of Colorado to earn this designation and only the sixteenth NPS unit in the country to do so. The national preserve joins Kissimmee Prairie Preserve State Park in central Florida, which was designated earlier in 2016 as the first International Dark Sky Place in Florida. The Preserve leadership believes these efforts are just the beginning in a long-term process to secure the preserve’s dark skies for years to come. IDA recognition is only one step along the way to success, but an important gesture in rewarding the hard work already done. “This designation, and the hard work the preserve staff has committed to, is a testament to the responsibility the preserve has entered into to protect its pristine dark skies for this and future generations,” said Superintendent Tammy Whittington. “We are thrilled to honor the excellent work to which Big Cypress National Preserve has committed itself, ensuring the protection of this resource in Florida,” said IDA Executive Director J. Scott Feierabend. Big Cypress National Preserve will work with local astronomical societies and nearby communities to develop outdoor lighting guidelines to further minimize light pollution across South Florida ensuring the preservation of this special resource for all to enjoy. “We could not be more proud. We had been assisting the Preserve with the application for this designation and waiting anxiously for over three years for the day to finally shout to the world that Big Cypress has earned it,” stated Diana Umpierre, IDA Vice President and IDA Florida Chapter Chair. Previous post: Don’t Miss the Orionid Meteor Shower!